We at Dogpatch Writers Collective are dismayed to report an unprecedented hack-in, resulting in the following completely unauthorized post. 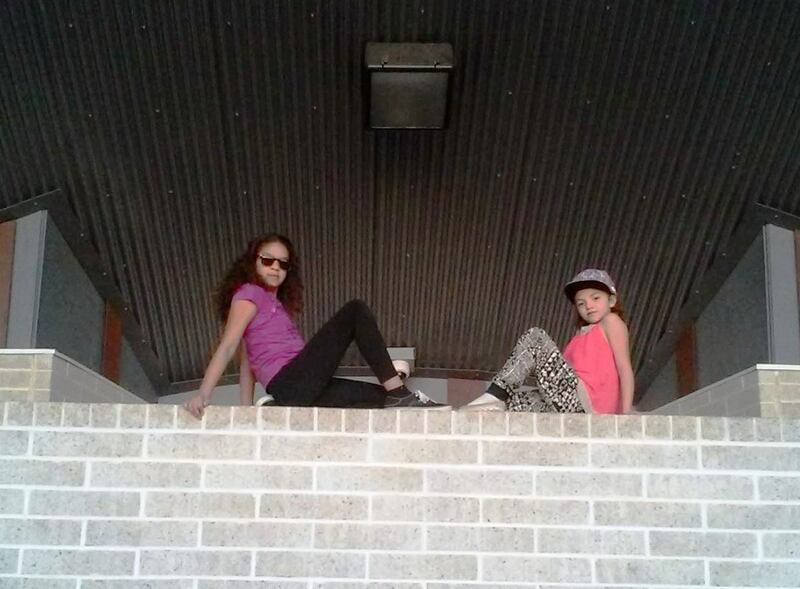 If anyone catches sight of these two miscreants, please notify us immediately. It’s way past curfew and at least one of them didn’t finish her social studies homework. Security footage of the two miscreants still at large. We also sincerely apologize to Mr. Allegra over at heylookawriterfellow for any feelings of undue peer pressure or actual guilt this post causes. Please be assured that it was not AT ALL pre-authorized by DWC management, although it does have us ROFL. NATALIA: Sssshhhh, we have to be really quiet so we don’t get caught by the SITE ADMINISTRATOR. SARAH: I’m not afraid of some dumb ol’ SITE ADMINISTRATOR. What’s a SITE ADMINISTRATOR? N: Not what, but who, and in this case it’s our Aunt Laurel. S: The Aunt Laurel who is shamelessly exploiting our kid cuteness and personas in this post, albeit for a very worthy event designed to encourage children of all ages to write and read poety? S: Does Mom know about this? N: Who do you think gave Aunt Laurel ridiculously adorable photos of us to unabashedly exploit in support of SpeakEasy 16, a unique reading series produced in Whatcom County, Washington? 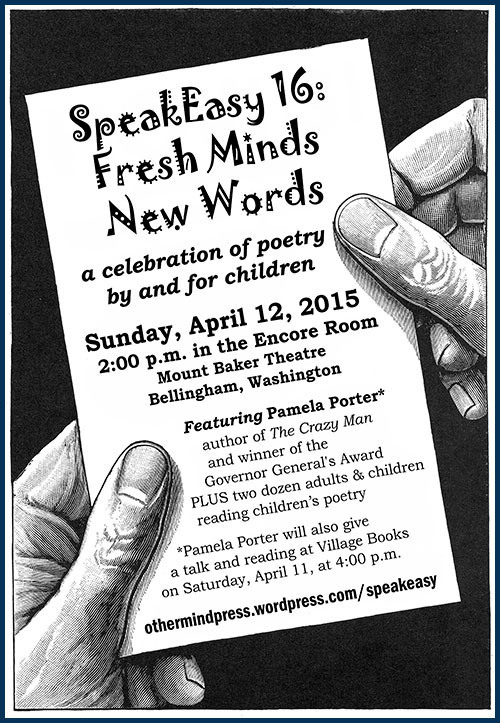 This particular event on April 12, 2015, at 2 p.m. will feature young poets ages 5 to 16 reading their original poems for an audience of children and adults who will gather at the gorgeous Mount Baker Theatre to celebrate these young poets. N: Look, here’s the poem Aunt Laurel is writing for SpeakEasy 16. The salamander went out last night. As usual, it ended in a back-room fight. S: She has no conception at all of what is age appropriate. N: What do you expect from a prose writer whose characters enjoy a tenuous existence at best on the gritty fringes of mainstream society and are frequently undone by their inherent flaws? S: She might do a much better job at this venture outside of her tawdry writing comfort zone into the wonderful world of children’s poetry if aided by an appropriately delightful and original doodle of a salamander, such as one that only that heylookawriterfellow could draw. Mike Allegra, a.k.a. 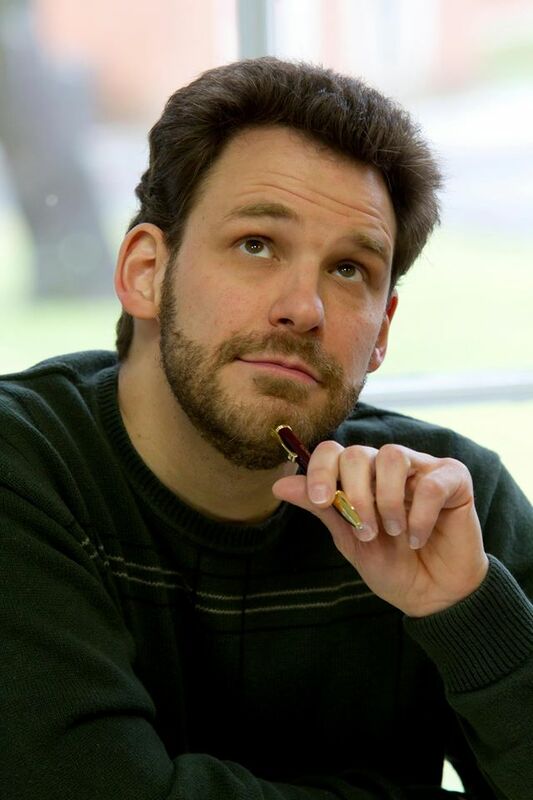 heylookawriterfellow: Will the famous children’s book author wield his doodling prowess to help the children of Whatcom County WA write poetry? We’re not even sure he’s ever going to read this post, but it could happen. N: The right illustration fully brings the text to life and allows a poem to speak to its audience on multiple levels. S: Should Aunt Laurel be forced to resort to stock art, the overall effect would clearly be diminished and lack artistic authenticity.